I’m not quite sure what to make of this drawing by Sleepybowie. It’s by far one of the most surreal unicorn drawings I’ve come across and that is saying something. 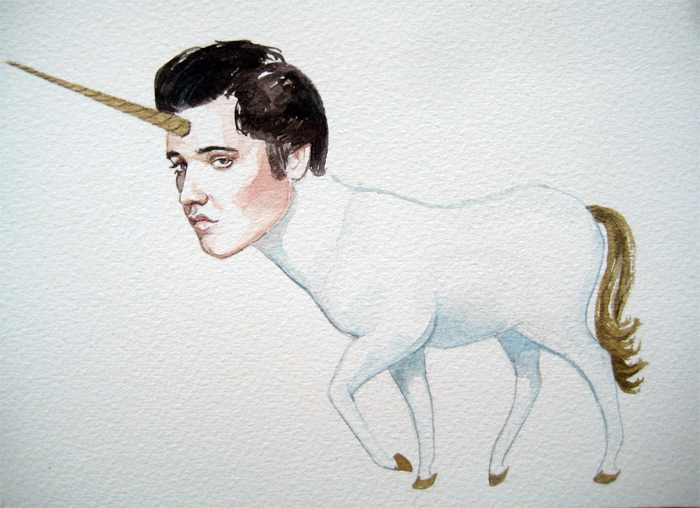 Elvis is sad, and a unicorn. And if you ask me that’s the type of thing a spoiled brat would pull. Elvis is probably therefore a spoiled brat. But he sure looks fine. As you have noticed my camera is a piece of garbage so you can’t tell that his hooves horn and tail are all metallic gold and shine like the blazes in the sunlight! glorious.